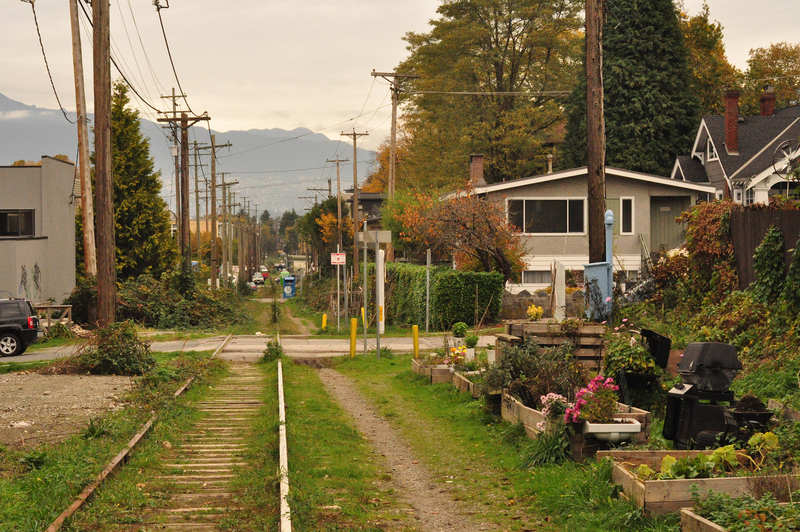 The recent controversy surrounding the Arbutus Rail Corridor arises from the long-standing discord between the City of Vancouver and the Canadian Pacific Railway. The 60-foot wide, 11-kilometre strip of CPR-owned property that makes up the corridor is the remaining sliver of a 19thcentury-sized provincial land grant—6275 acres—that was awarded to the rail company in order to provide transit access to the emerging city. Although the corridor is currently zoned as public thoroughfare for rail, transit or cycling and some greenway space, it offers its most idiosyncratic use-value as community garden. This itinerant spatial program—one that although condoned and controlled, maintains an air of illegitimacy—has become an unwitting cog in the complex machine that determines the future of unused civic spaces. The prominence of the gardens in the debate is a testament to the role that soft programming might play as a political and spatial tool in city planning. With its value as a rail corridor obsolete, the CPR has been trying to capitalize by petitioning the city to rezone the strip. In a 2006 Supreme Court Case, the rail company claimed de facto expropriation against the City of Vancouver, arguing that zoning restrictions were handled in such a way as to limit the CPR’s ability to benefit from owning this highly valuable piece of property. The court ruled in favour of the City and since then the two parties have been tenuously negotiating the land value by ratcheting the selling price up and down between $20 and $400 million, but never agreeing on workable deal. When backhoes rolled in during the summer of 2014 and began tearing out garden plots that have been squatting on the margins of the site since before the last train trundled down the tracks in 2001, popular media renewed the iconic image of capitalist process encroaching on the happy lives of hard-working, industrious citizens. By mobilizing the bulldozers, the CPR sent a clear message to the city both about the value of the gardens and their precarious position at the center of the negotiation. The fact that the empty corridor is not empty is a decisive factor. In the mid-1990s Ignasi de Sola-Morales Rubio, Spanish architect and educator, appropriated the French term terrain vague to refer to those civic spaces that seem to have fallen outside the city’s “effective circuits” and “productive structures.” Abandoned buildings, industrial areas, crime-ridden neighborhoods, ports, slums: any territory that is un-safe, un-productive or un-inhabited winds up in the category of the terrain vague. But more than that the concept describes a cultural fascination with spaces of ruin, dilapidation and general incongruity. For Rubio, there exists a necessary attachment to such territories because they unintentionally memorialize a disappearing past while signaling an optimistic future. The tension between past and present explains the tendency to celebrate these areas in photography, literature, film and civic debate, but it also makes it difficult to install new development without cancelling out the effect. In Vancouver, the terrain vague is actively conditioned by its use as community garden. Portions of the rail corridors are populated with all manner of kitsch: old toilet bowls used as planter pots, cottage-culture carved signs, garden gnomes, brightly colored lawn furniture, rocks with painted faces, bird baths, and white picket fences. This array of objects is indicative of a significant placemaking sentiment in a city characterized by the glass tower and the immaculately trimmed privacy hedge. The rail allotments become the personalized backyard to the rapid development that takes place around them. Rather than allowing the space to exist as urban blight, the gardens nudge the empty rail corridor into a marginal position between productive and unproductive space. They conjure a use-value for the land but they do not produce significant revenue, nor do they become so established as to eliminate the ambiguity of the space. As a result, they maintain its position outside the effective circuitry of the city while giving Vancouverites a means of integrating the space into their daily lives. This position is what makes soft or itinerant programming a valuable tool in determining the future of these disused spaces.